Offering excellent value for money, the Euro Reflector is a great choice if you're looking for a good open-ended reflector on a budget. For a low-cost reflector, the Euro certainly comes with a host of features to maximise performance. It has a dimpled aluminum finish and a curved fold above the grow lamp. 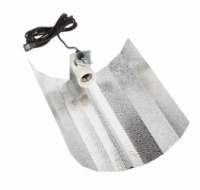 This improves light reflectivity and distribution, helping to ensure healthy and even growth. For ease of use and simple hanging, the Euro reflector also features two pull-up hanging tabs.